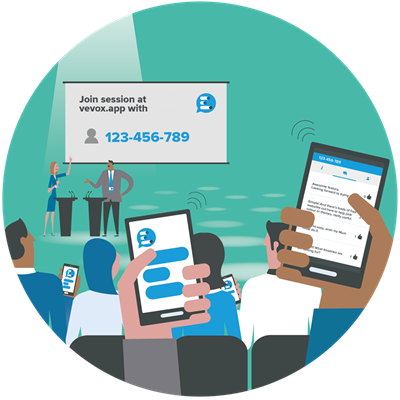 Vevox’s Q&A feature is simple to set up and use, leaving you free to focus on delivering a memorable session for all the right reasons. Optional moderation and anonymity settings allows for a balance between giving your audience a voice whilst remaining in full control. Participants can submit their own questions or comments, as well as 'up vote' those from others, helping you to see what matters most. Running Q&A the Vevox way means facilitating maximum participation and inclusivity without interruption. Optional anonymity settings are the key to increasing participation in Q&A sessions. Whether you're discussing a difficult topic or simply want honest, uninhibited feedback, Vevox gives everyone a voice. Our 'Like' feature allows the audience to give a +1 to other questions or comments they agree with. Using the sort by likes feature you can display the most popular posts first, helping you to increase participation through this interaction. Turn this setting on to preview all messages sent to the Q&A board and review them before publishing. Vevox's moderation feature gives presenters and facilitators complete control and therefore, peace of mind.